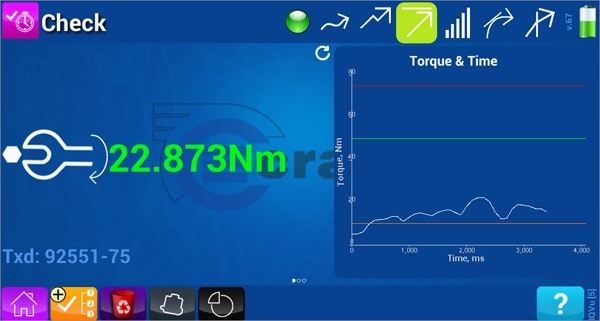 Blueberry helped specialist precision tools company, Crane Electronics, move its business into hand-held devices by writing the code for their Android tablet-based Torque Data Collector. Crane Electronics designs and supplies a range of specialist precision tools for measuring torque (the strength of force applied to a fastening, such as a nut) in an engineering situation. Crane customers include many household names, such as car giants, BMW and Ford. Crane had previously been using relatively unsophisticated management software for taking torque measurements with a tool which required a laptop or PC connection. The company wanted to bring its technology into the 21st century and move the measurements to a hand-held device. Blueberry built a proof of concept for the software Crane wanted – an Android-based program to collect and graph real-time data for a hand-held torque data collector, called IQVu. The code for the Torque Data Collector involved writing low-level interfaces with the tablet’s USB ports and creating Arduino electronics to simulate the transducer attached to the torque wrench. Enabling measurement readings and associated information to be stored on the IQVu, which can then be saved to a USB stick or emailed directly from the device. The data can also be uploaded over a network connection or USB cable to Crane’s existing OMS and Opta Comms systems. Ability to load PDFs of documents, work instructions, photographs and comments onto the IQVu and store against Jobs. As well as being loaded from a USB stick, photographs can also be taken using the 5 mega pixel auto focus camera built into the IQVu. An advanced help functionality available from all screens. A barcode reader which allows the operator to scan information such as product or part identifiers, user details, comments and references into the IQVu. Easy back-up of data to an external source with minimal key presses. Equally, the data can be restored to the IQVu with the same ease. A software security package which ensures that no software can be loaded onto the IQVu without authorization and that email traffic is strictly controlled. Ability to confirm a pass-fail status of torque. Ability to plan a round of upcoming jobs to maximize efficiency. Enabling Wi-Fi, RF, Bluetooth and 3G connectivity. Compatibility with all existing and new Crane products, including their wireless devices, which allows complete flexibility when collecting data. The IQVu is said to be the most revolutionary torque data collector in the world, capable of measuring and collecting torque, angle and pulse data in the manufacturing and quality environment. It can take thousands of measurements in near real-time (every 1 millisecond), but still has a small footprint. Crane sells the Data Collector as a hardware/software product on a Getac ruggedised tablet, suitable for use in “shop floor” engineering environments. It is now seen as a world-leading product of its kind.